Our conscious intention was to design a new archeological museum in Nicosia that would be a city landmark, a cultural and creative core. A museum that is an integral part of the site, reconstructs archetypal spatial arrangements and uses the elements that make up the Mediterranean expression as a means of synthesis. In other words, a dynamic multicultural core that would go beyond the narrow confines of the museum building. The museum employs its structure to trace the conditions necessary for the contact and understanding of Cypriot culture back to social osmosis, outdoor life and the vital relationship with light and nature. 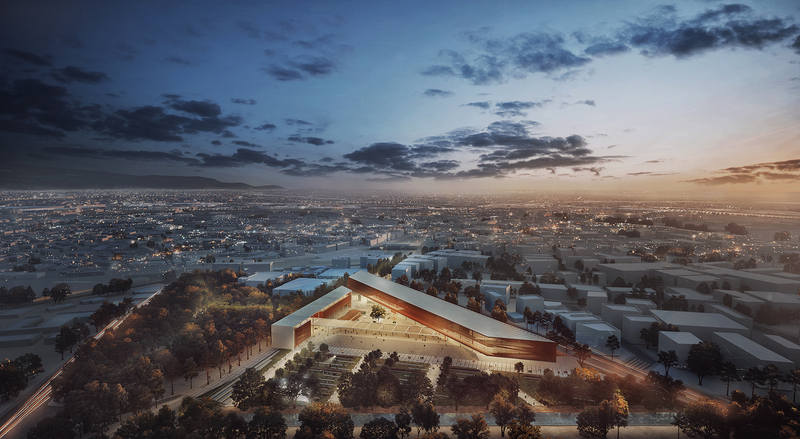 In this project, the museum attempts to be embedded in the site, obeying the dynamic tracings of the city that will host it. Its discrete structure, the dynamic and concrete geometry are configured in inherent simplicity. Light is a frame of reference and a defining factor, forming excellent spatial qualities and volumes. The new archaeological museum of Cyprus, silent in its form, vibrant in its role as a core of culture and social interaction, redefines the meaning of a landmark. A structure open to the visitor’s level, spaces of variable introversion, devised visual outlets and spatial experiences, all attract the passerby and render the museum an extension and integral part of the city. In this composition, all of the above seek out harmony and the perfect equilibrium. They collide, intertwine and try to achieve the optimal functional structure with the minimal intervention. The museum is defined in time by a timeless simplicity. It addresses past and envisions the future, promoting culture, social osmosis and the value of the Cypriot History at present. Trigonica Simplicitas. 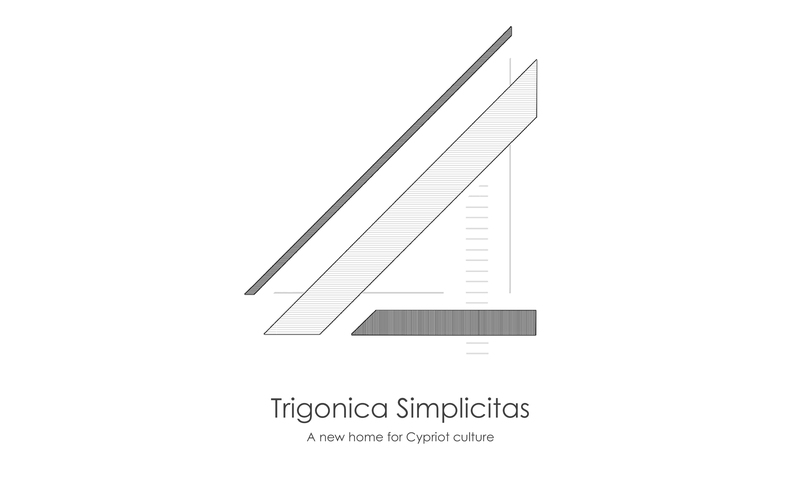 A new home for Cypriot culture. The new archaeological museum of Cyprus emerges from the city, shaping the skyline, and promptly marks its presence and operation through its simple and discrete geometry. Open structure, spatial experiences, visual stimuli and devised visual outlets describe the relationship of the museum with the city. They invite the visitor to rise from the city and discover the square, which is an area of transition between the city and the museum. All the modules that make up the new museum are developed around that square, which constitutes a capacitor of movements and serves as a means of social osmosis. Urban flows outline the main lines of the compositional and interact with it. 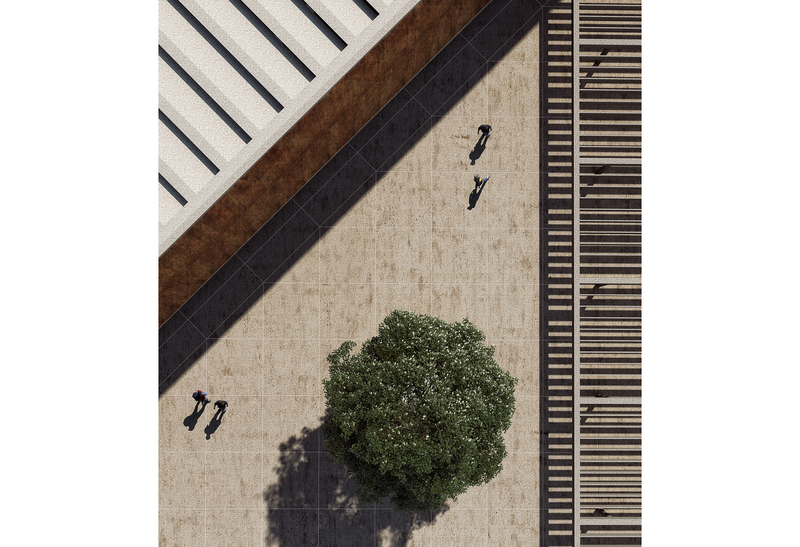 The urban path (an extension of Omirou Street) is the composition’s organizing principle and a means of consolidating the museum and Eleftheria Square. It converses with the Municipal Garden and receives free flows of people and movement from that direction. A raised area will facilitate the transition from the city to the museum, subverting the traditional concept of the ‘entrance’ and reconstructing the archetypal structures of the square and the atrium. This will be a cultural space, promoting outdoor life and social osmosis. All the operational units of the museum are organized and developed around the square. point, the gift shop, the café- restaurant and the temporary exhibitions, so as to establish a reciprocal relationship with the square and its people. A rectangular transparent prism is exalted with respect to the square and the city. It hosts the museum facilities and ensures the museum’s relationship with light and the urban landscape. Its dynamic and concrete geometry leaves an imprint on the sky, shaping the city skyline and marking its presence. The prism’s vibrant facets address the city, reveal the museum’s functional structure and celebrate the primordial power of time. The monolithic basis of the composition makes up the raised square. It houses all maintenance-associated units, so as to make use of the natural light and allow the museum employees a physical and visual outlet. It also facilitates a direct relationship with the ground level (service zone). 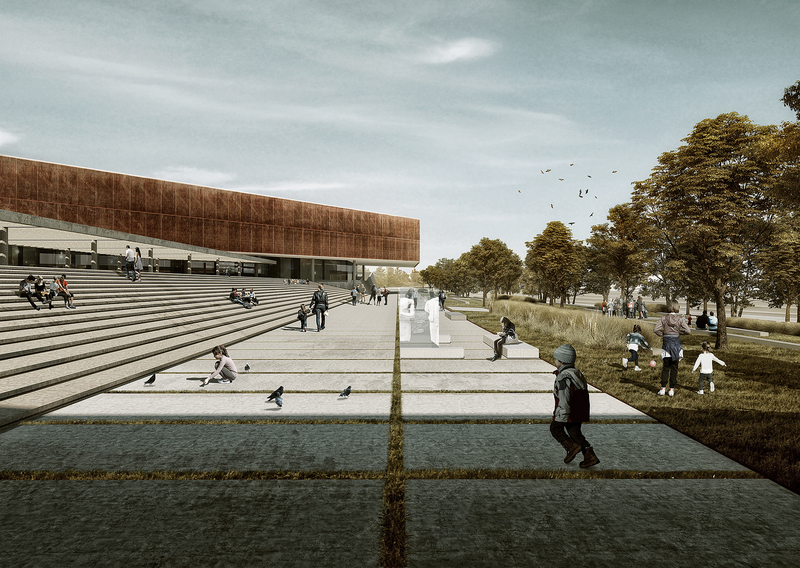 The museum retreats with respect to the skyline of the landscape, creating an expanded cultural park that unifies the linear park of Pedieos and the Municipal Garden of Nicosia. 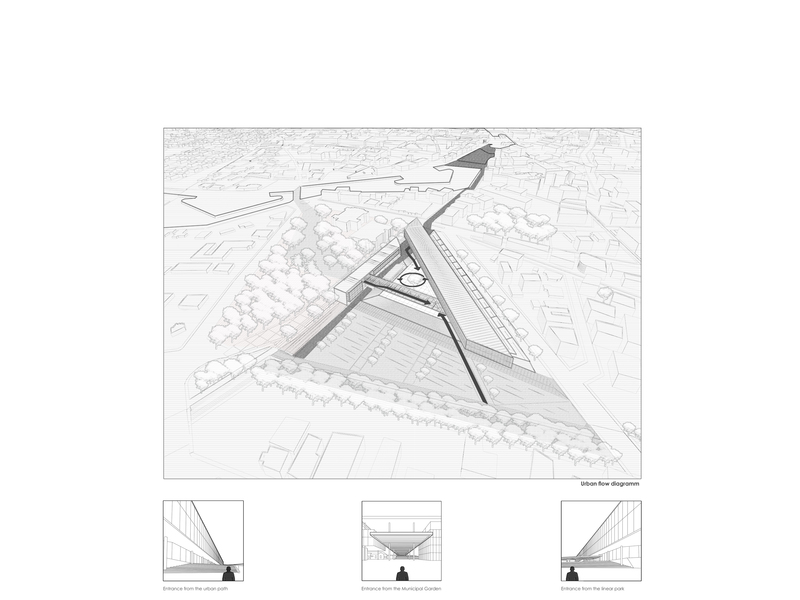 The proposal for the NAMC is distinguished by its distinct and inherent simplicity in terms of structure and expression of form. 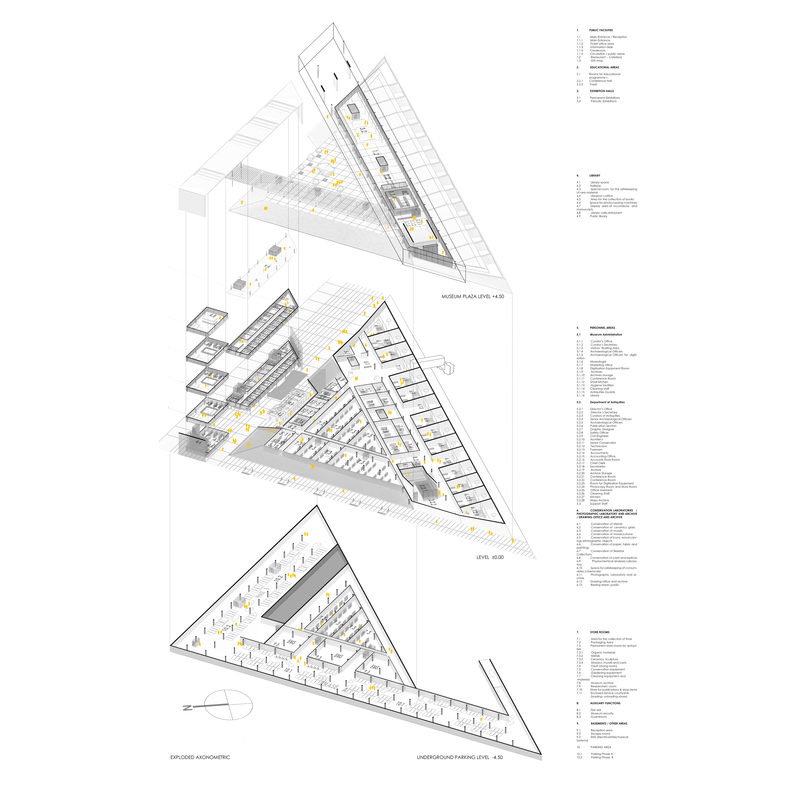 There are three main synthetic actions that outline the structure of the new museum. 1_All of the museum functions related to the public are located at square level. The commercial operations that ensure the sustainability and development of the museum (gift shop, café, restaurant) are sited at the pilotis created by the transparent prism that rises above the square. Temporary exhibitions are located at the same level, given that their content changes frequently and, therefore, they are likely to target a wider audience and attract more visitors to the museum. Due to the retreat of the glass panels with respect to the plate, all of these spaces constitute a conceptual extension of the square, which operates as a social capacitor and the core of the composition. Their function is directly related to the archetypal structure of the Mediterranean living, as it makes use of the indoors, the outdoors (square) and the space in-between (stoa). 2_Separating the permanent exhibitions and siting them in the rectangular prism that rises above the square and the city. All units are consolidated by the cohesive museum course that starts from the main entrance. Guided by the light, visitors slowly rise from the level of the square, following an inclined plane. Throughout the museum course, visitors move between the square/city and the museum units. The visitors pause at the rest areas between the units, to repose, observe the city and take in the stimuli they received. At the end of their tour and before exiting from the main entrance, visitors could stop (indicatively, they could go to museum’s café), to reflect on the course they went through and hearken to the value, the continuum and the influences of the Cypriot culture. 3_Creating three distinct, firm and inward-looking cores that develop in two levels and accommodate six museum units. These cores are evident in the structure and design of the museum. They provide the introspection necessary to concentrate, understand and take in the value of the exhibits. They consist of a separate structural system involving metal cross sections and prefabricated concrete panels of standard dimensions. This system aims at ensuring the volatility of the exhibitions and the possibility to adapt to new museological approaches in the future. The museum’s distinct structural system enables the expansion of exhibition spaces up to 25%, a precaution taken given the ongoing archaeological excavations in Cyprus. 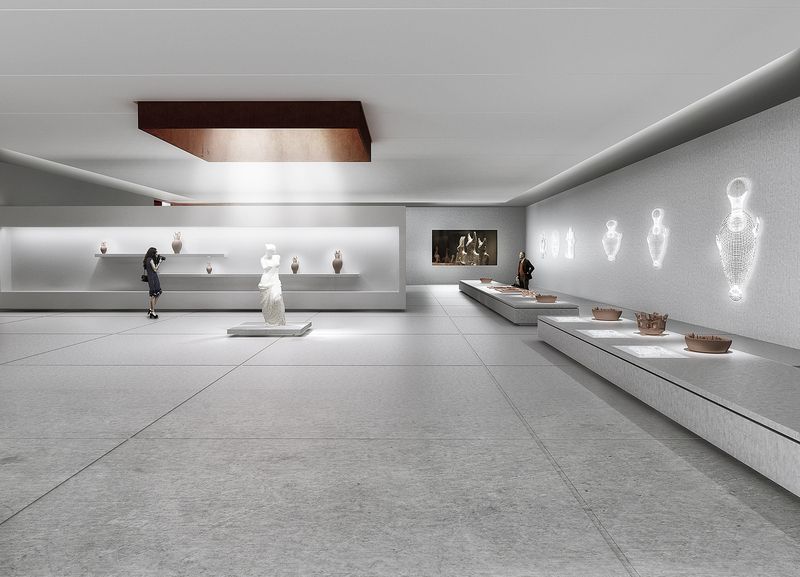 The new archaeological museum of Cyprus is indissolubly tied with natural light. Always indirect and controlled, light facilitates exceptional spatial qualities and visual outlets into the modern city of Nicosia, and organizes the main museum course. Specifically, there are two light management systems, centered on the rectangular prism that is exalted in relation to the square and emerges from the city. The first, which outlines the facets of the museum, consists of a perforated double sheet system of sheet iron. Arranged successively, the sheet irons are connected to the central system (BMS) and regulate the degree of perforation and transparency of the whole museum. Since they are used in their natural color, they change over time and reflect the course of their natural wear. The new museum employs its perforated and rusted facets to address the city, reveal its functional structure and celebrate the primordial power of time. The second light management system is related to the roofing of the museum and in particular to the light that enters from the titled beams of the static structure. A series of successive and changing filters (connected to the BMS) ensures more than 548 different qualities of light. Therefore, a certain volatile quality with regard to the light is achieved in the spaces of the museum. Four small educational centers are located among the firm cores-permanent exhibitions. Following the contemporary museological trends, the educational centres are inextricably linked to the exhibitions and are considered part of the museum course and not a standalone room.